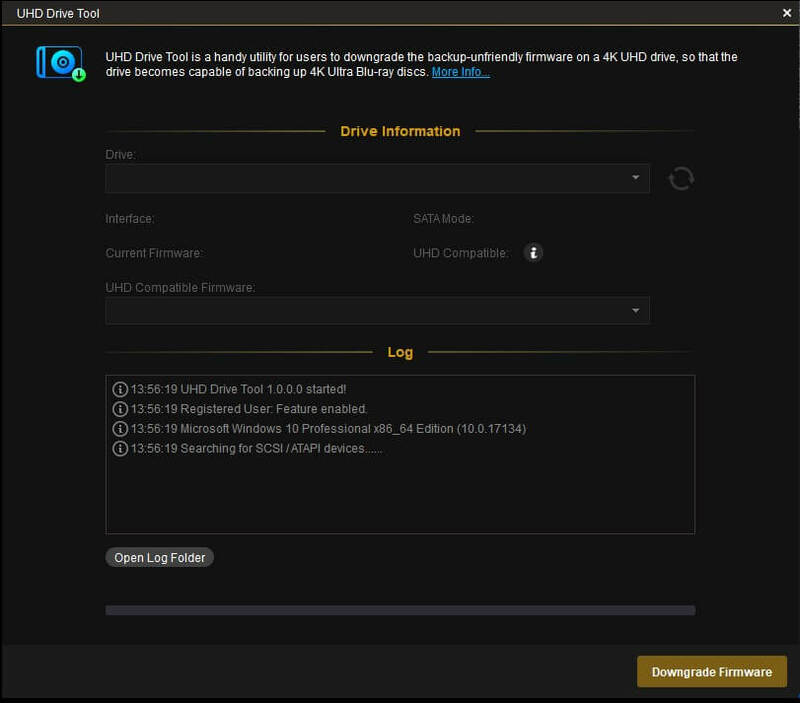 DVDFab UHD Drive Tool | Downgrade the unfriendly firmware on a UHD drive to make it ready for UHD Blu-ray backup. Backing up the legally purchased 4K Ultra HD Blu-ray discs for home use is what every 4K Blu-ray lover will do. To do that, a 4K UHD drive compatible with popular UHD backup tools is a must. However, if a 4K UHD drive is natively manufactured or personally flashed with the latest firmware, then it may not be able to work with that sort of software tools. Panic Not! DVDFab UHD Drive Tool is the solution you’re looking for. It is an extremely easy-to-use Firmware Downgrading Tool to help you dump the current firmware on your 4K UHD drive, so that you can make legal backups of your expensive and precious 4K Blu-ray discs. 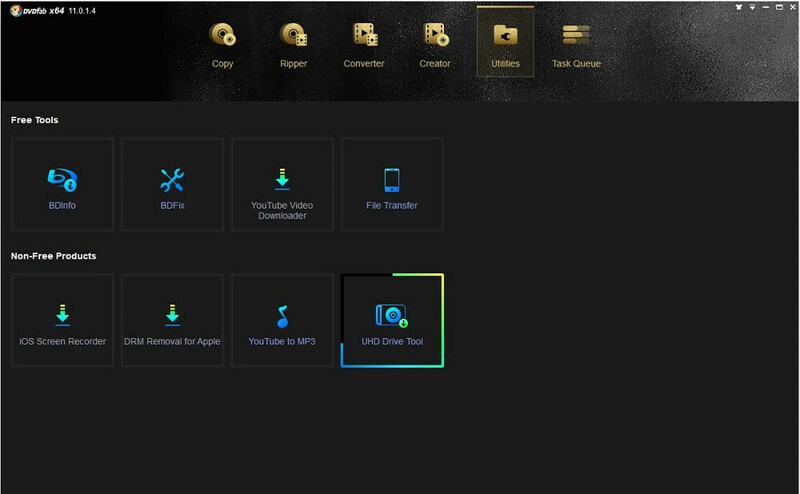 The only designed mission for DVDFab UHD Drive Tool is to help users to downgrade the firmware on a 4K UHD Drive to the backup-friendly version. Once successfully flashed, that drive shall have no problem working with 4K UHD backup tools, such as DVDFab UHD Copy and UHD Ripper, to copy or convert 4K Ultra HD Blu-rays for backup purposes. This handy firmware flash utility is surprisingly easy-to-use. No profound knowledge or special skill is required to perform the downgrading process, even to non-tech savvies or green hands. As long as you follow the step-by-step instructions, you won’t feel a thing at all. As of now, nearly a dozen of popular 4K UHD drives produced by major manufacturers, such as LG and Asus, have been supported. It’s lucky for you if you already own one of the drives mentioned in the Supported List. If not, don’t bother either, as that supported drive list is being constantly updated to include more drives. Note: This list will be constantly updated as we support more drives in the days to come. 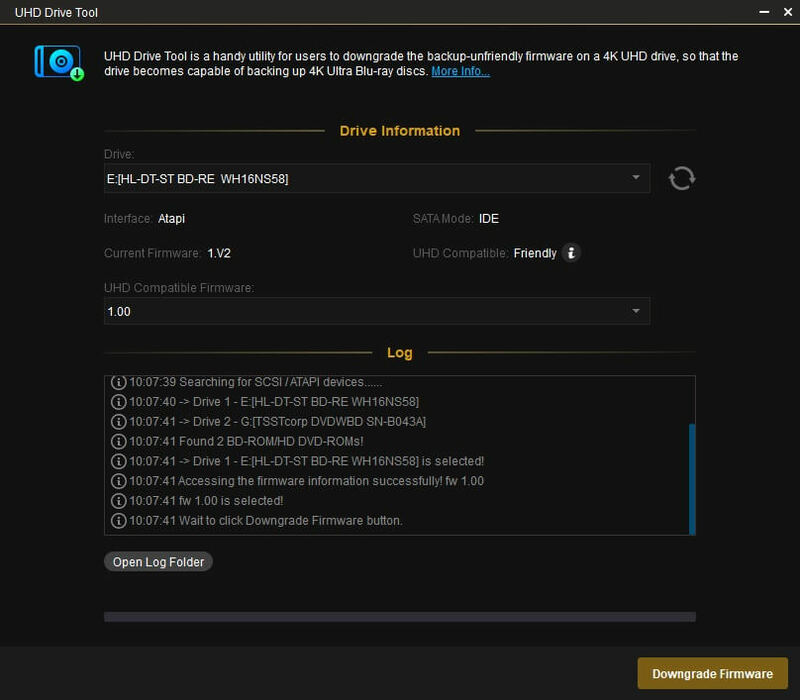 Step 1: Change the SATA port mode of your UHD drive's connection to IDE mode, take out any disc from the drive and then launch UHD Drive Tool from DVDFab -> Utilities. Step 2: Select your UHD drive from the available drive list. Step 3: Click “Downgrade Firmware” button. Wait as the Friendly firmware is flashed and success is reported, then reboot your computer. As more and more people jump to the boat of 4K Ultra HD Blu-rays, the demand on relevant tools to handle 4K Blu-rays also increases rapidly. Customers' need is always what the developers at DVDFab care about the most. To answer this call, we've rolled out a complete 4K UHD solution package to help you copy, rip, burn, convert and play back the 4K Blu-rays (including Cinavia-infected ones), or even make your own 4K Blu-rays at home with your personal videos of all formats.